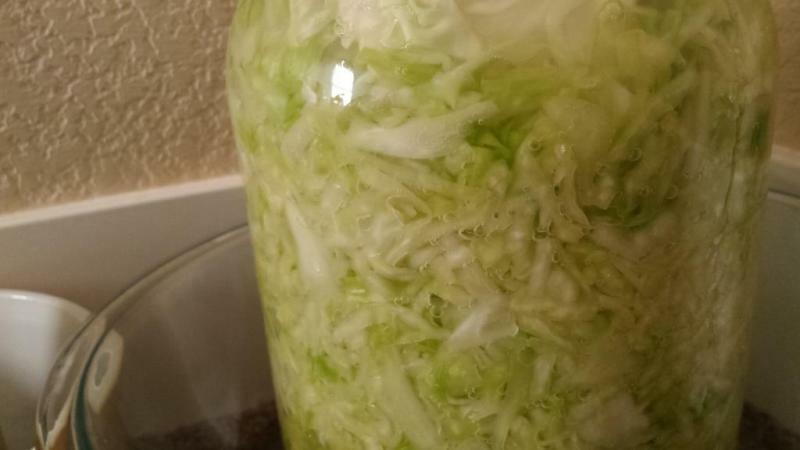 Figured I drop my way of making Sauerkraut in here, there are lots of different methods but this is what works for me. Additions can be added as you see fit. 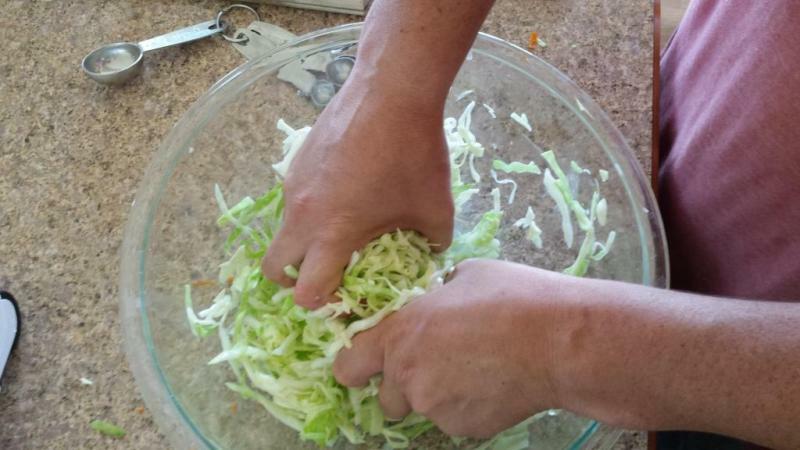 Wait for 10-15 minutes and then begin to "work" (toss, sqeeze, twist) the cabbage. 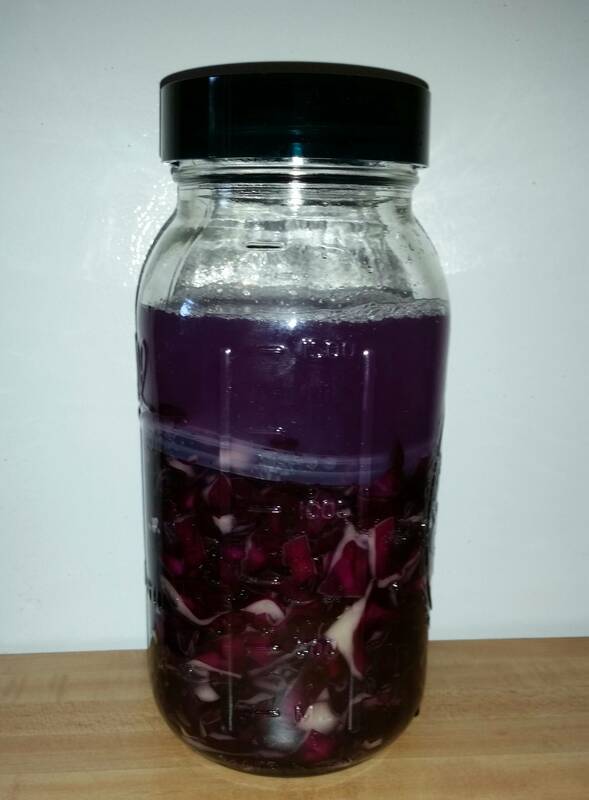 Put all in a vessel of your choice, throw the cores in on top...they make good kraut "pickles". Add some brine till your happy with level, If i had to describe, id say fill till about brine is about half way up your jar, no real science i just like a little extra brine. May have to burp jars every day or so for 1 week. It will be done in about 1-1.5 weeks, I let my go for about 3-4 weeks to get that real "sour" taste. 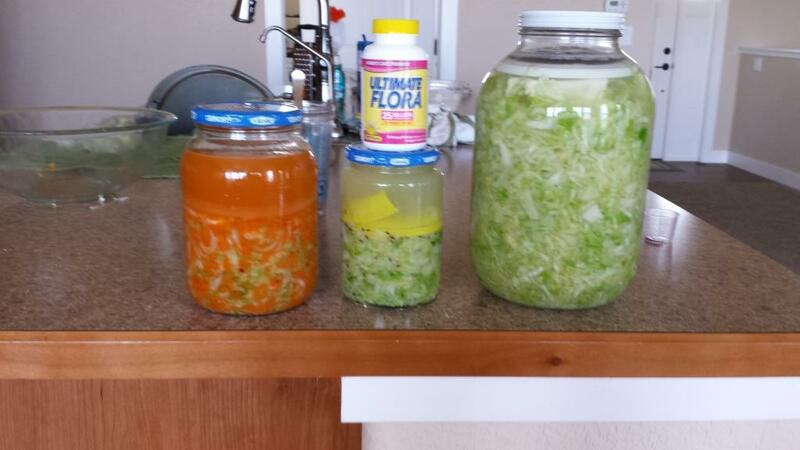 When done fermenting place in fridge, each time you take some kraut out be sure to puch all back under the brine. Disclaimer....you will also see in recipes where it calls for you to pack the sauerkraut down super tight in the jars. Ive done it both ways and see no real advantage but either way up to you. Edited by beerbreath81, 06 October 2014 - 06:31 AM. Nice lid idea. I do mine in buckets. I weigh them down with a plate, and rock. "My ratios are 2 tbls per head of cabbage:" Okay...2 tbls of WHAT?? Why is the one jar so red? Thanks. "The Pacific Northwest GLOG is the place to be." It would be neat to see all your pickling and canning recipes and demos merged into their own subform. You have a well laid out, well illustrated cookbook here. Thanks for kind words man much appreciated. I made tons of mistakes along the way. So just like to share ones that work in hopes someone can use them. 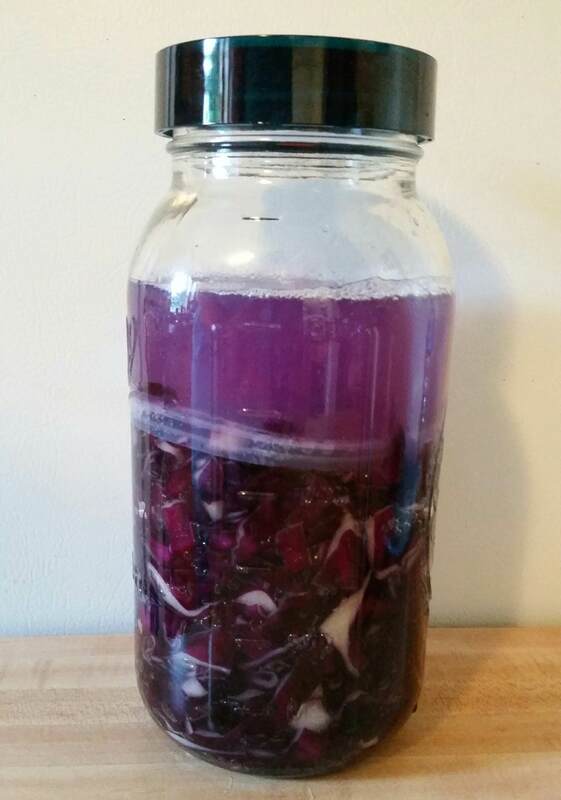 If I am using a airlock to ferment do I still need to keep it under the brine? Started a batch last night. Thanks for the recipe notes. JoeFish... Everything I have seen in my research says always keep it under the brine. So I would say yes but maybe some more experienced folks will chime in. Ask stickman he's very knowledgeable in the art of kraut fermentation. But when fermenting peppers I always keep mash below the brine. 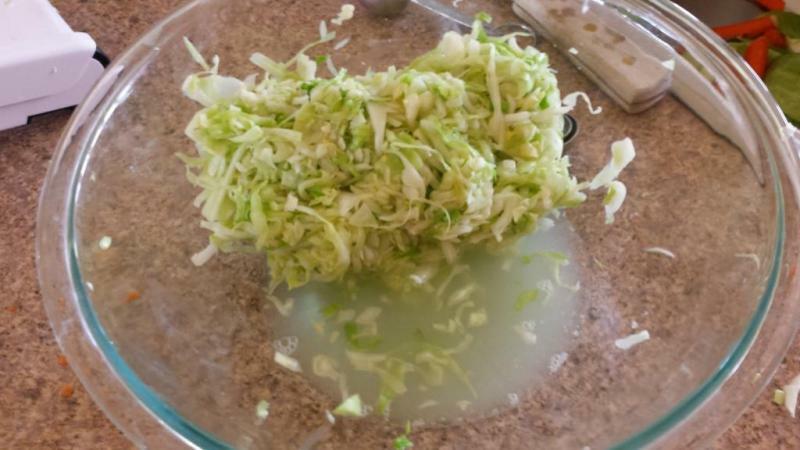 i always keep a running production of kraut on the go but over the years i am finding the quality of cabbage has really degraded. i can get it at times at .39 cents a pound but it appears almost white. it doesn't grow well in my zone 3, otherwise i would have a garden full. i have blown a couple of batches in the past, too much salt. so keep that in mind for first time kraut attempts...more salt is bad. i have read about people using kale and think my next batch to incorporate a blend with kale. Cabbage doesn't grow well? Wooaa.. that has to be a bad place. Here it grows like crazy, but to many issues with Cabbage flies to enjoy growing them. 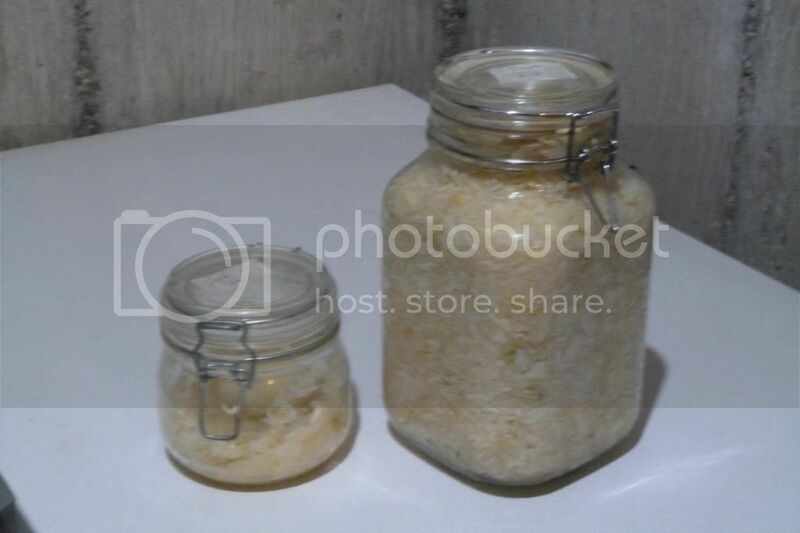 Why do you guys use jars? We have special ceramic pots (Gärtopf) with a ceramic weight to hold the cabbage down. 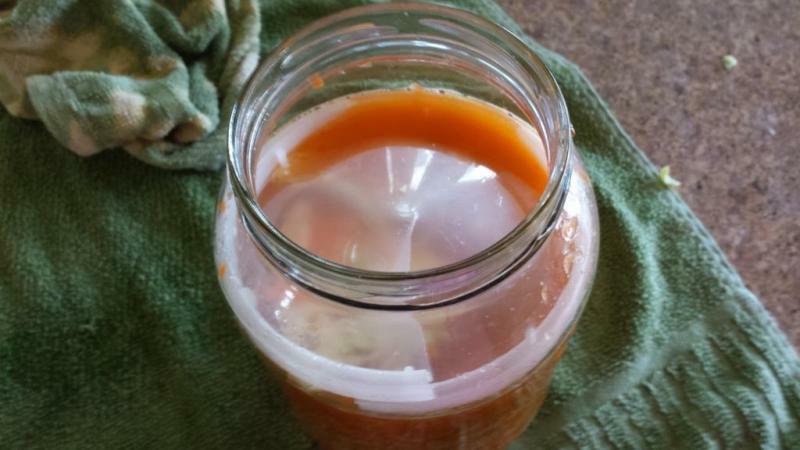 It really works like a charm and you don't need to burp the jars. They are very inexpensive and last you a life time. Sauakraut is the best winterfood hands down. 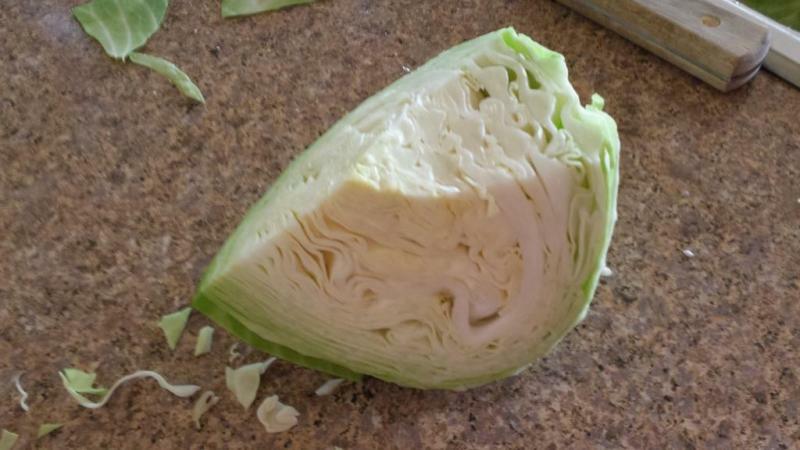 Cabbage doesn't grow well? Wooaa.. that has to be a bad place. like mentioned, zone 3..... I have found a cold weather hybrid that states a 60 day maturity but my summers are extremely dry and arid. can't grow hot peppers outside in the ground either. I ferment in a 1 gallon ceramic crock then transfer into glass containers, then into my beer fridge. I am aware of many that just keep adding to their crock and keep a continuous running ferment going. 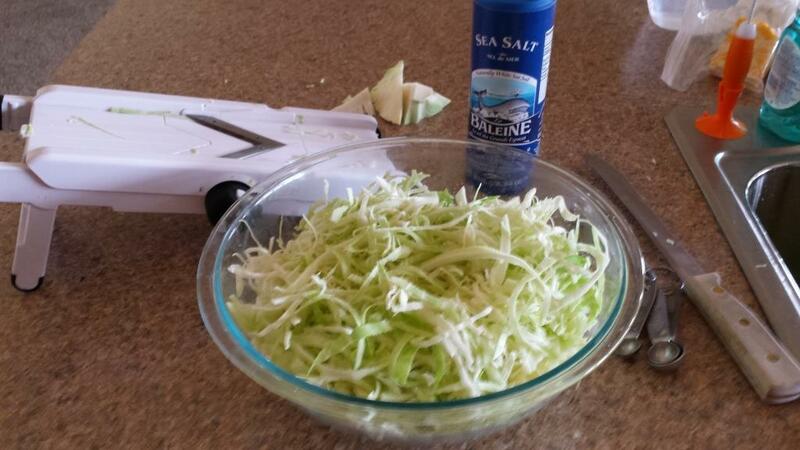 growing up we had a 5 gallon stone crock(my mom still has it) but we never made kraut. It wasn't until I finished college and moved out on my own that I started smoking meats, curing fish and making hot sauces that I educated myself on pasteurized vs unpasteurized. never again will I buy a can of sauerkraut! ........... and I don't add caraway seed either(hate the smell of caraway), nor do I add white wine. I have considered adding juniper berry. I love me some sauerkraut. I've always hated the taste of canned sauerkraut and the texture really sucked too. My grandmother used to make it in a big stone crock but that has since disappeared throughout all the relatives fighting over it. I'm wondering now if an old crock from a slow cooker might work. 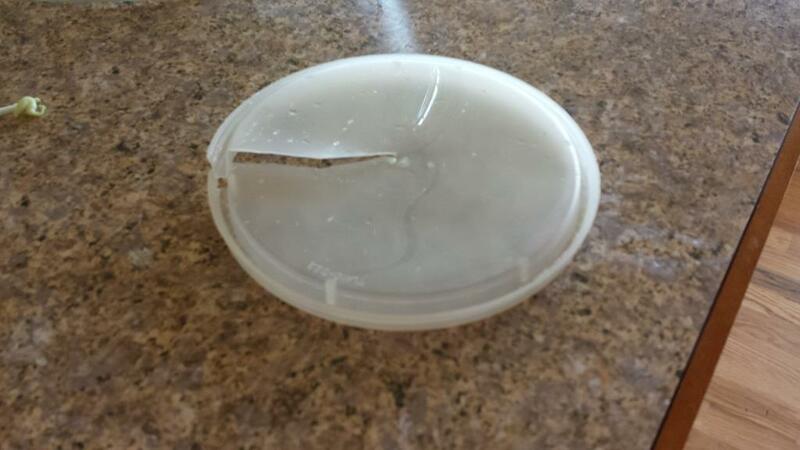 sure the lids are glass but there's gotta be some way to seal it. the crock i use is originally from a Rival slow cooker and my lid is plastic. 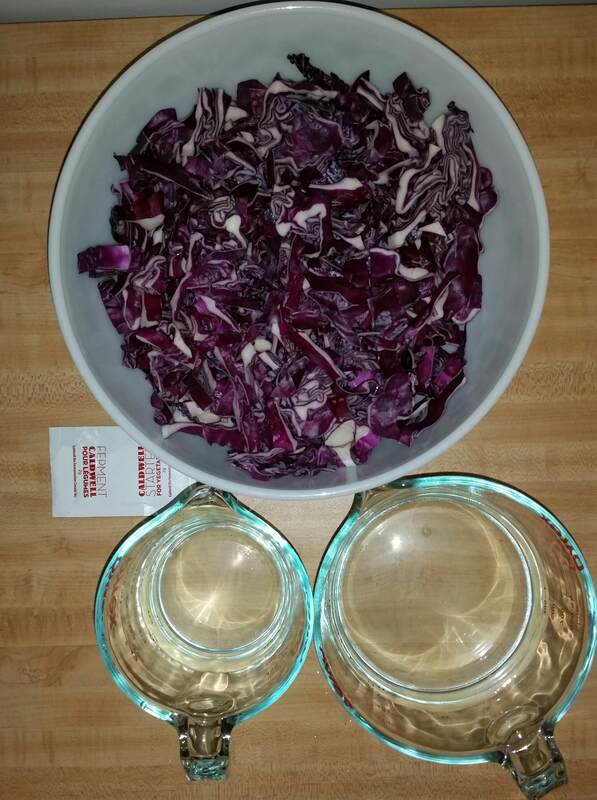 so what i do, peel some of the cabbage head leaves off and save them(whole). then i core and process the head in my food processor. mildly salt the batch with pickling salt and let sit for an hour or so. the batch is pressed into the crock. the saved leaves are shaped and laid across the top. 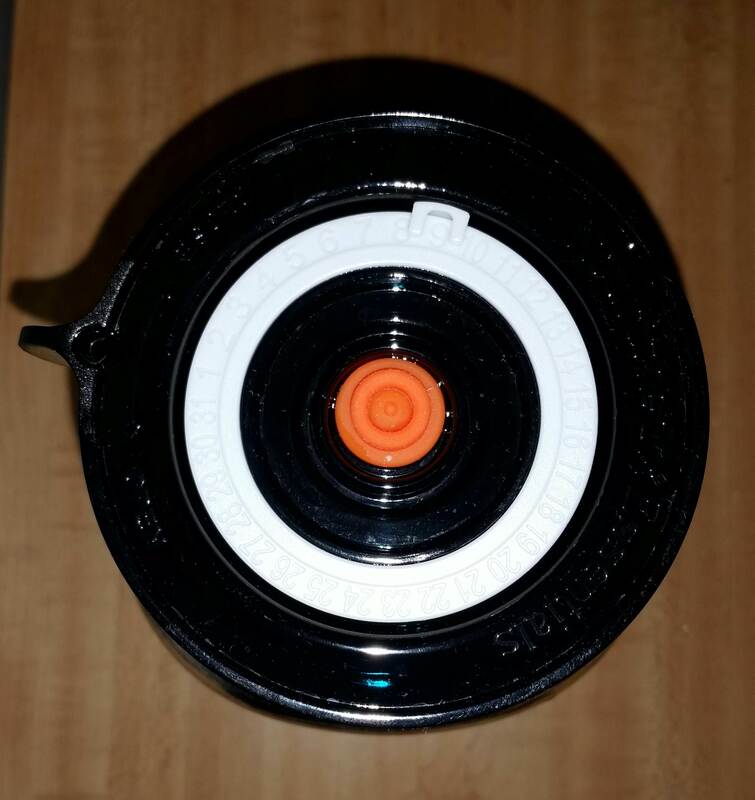 the product is then pressed down to ensure liquid covers the batch. a weight is wrapped with a cloth or even a paper towel and placed on top of the batch. a towel is then draped over the crock and the plastic lid is placed on top. i check the batch every couple of days and if any mold forms, it is on the saved leaves. i just pull the top layer and discard, so it is good to save several leaves. it is rare but can happen. good luck and i strongly encourage you to get started without hesitation. 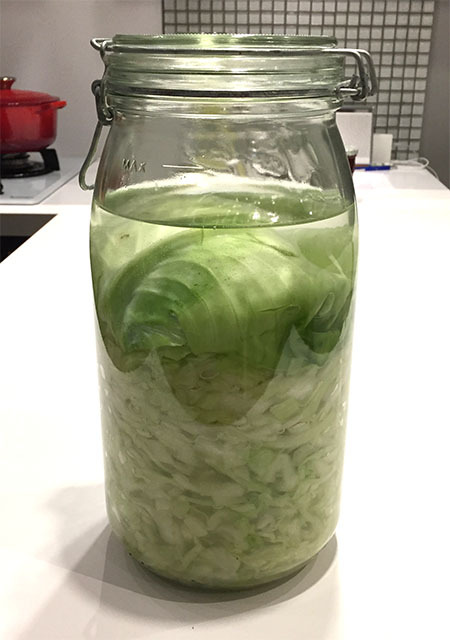 after several batches, you will want to experiment with kimchi, it is a natural progression. after 8 or more days at 70 f/21c you put it in the fridge for another 8 or more weeks. more of a curing process at that point in the fridge, though it is still live and 'active' and can be kicked up again. I'm lazy with sauerkraut, or rather my memory is lazy. However 2% salt by weight I can remember. And if one needs/wants extra brine, then, you guessed it: at 2%. 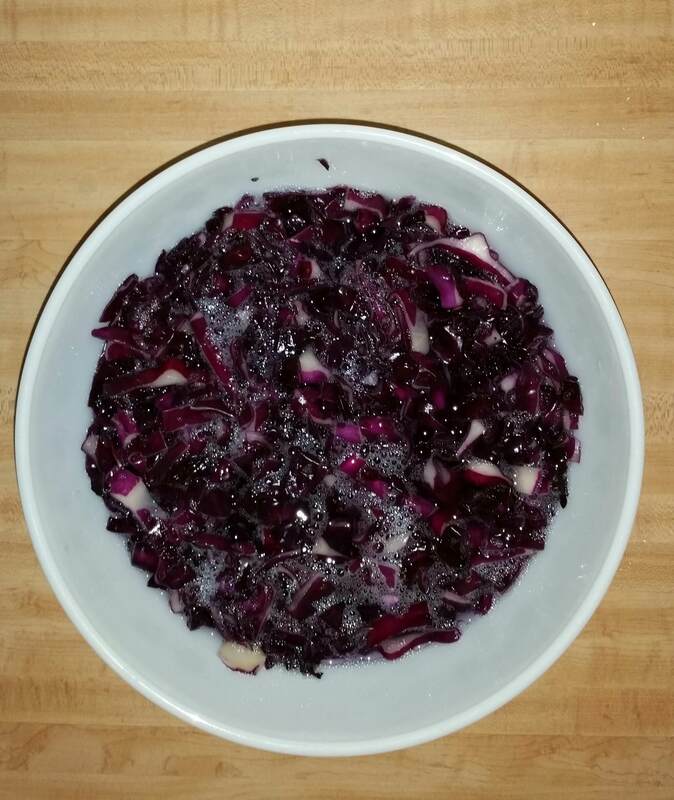 Unfortunately no dice on the red cabbage - c'est la vie. Edited by nice.chili, 12 August 2018 - 03:06 PM.